Which persons may have seen or handled the gold plates? How can mothers pursue vocational opportunities? 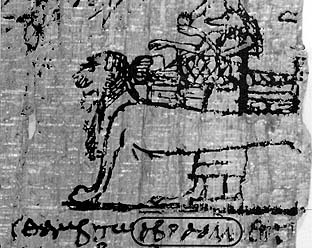 Since Joseph Smith connected the facsimiles in the book of Abraham with the Abraham of the Bible, some people have wondered if Abraham is ever mentioned in Egyptian papyri. Recent examination of evidence shows that the name of Abraham does indeed appear in late Egyptian texts. Of course, acceptance of the book of Abraham, like acceptance of all scripture, will always depend on faith (see 3 Ne. 26:6–12), and the only real proof of scripture can come only through the power of the Holy Ghost (see Moro. 10:3–5; D&C 50:17–23). But a knowledge of external factors can help in the search for truth, and a number of Egyptian texts mention Abraham. After gathering dust for many years in various museums and libraries, several of these are now drawing the attention of scholars. There are dozens of references to Abraham in Egyptian texts, some of which have traditionally, been called “magical,”1 although many scholars are not sure how to distinguish ancient magic from religion.2 The references occur in five different languages﻿—Demotic, Old Coptic, Coptic, Greek, and Hebrew. Here, we mention six of the references to Abraham, dating to the third century A.D., most of which came from Thebes, the place where the Joseph Smith papyri were found, and were originally acquired by Giovanni d’Anastasi, who sold them to several museums in Europe. These first three references all come from the same papyrus. The mention of “Abraham, Isaac, Jacob” assures us that we are dealing with references to the biblical Abraham. Also, these references point to some sort of connection between Abraham and the lion couch, though the exact nature of the connection is obscure. 4. The fourth mention of Abraham is in a papyrus containing many references to Judeo-Christian religion; the same scribe who copied the previous papyrus copied this one, too. A long chapter on using a lamp to get revelation instructs the individual to call out, “O Khopr-Khopri-Khopr, Abraham, the pupil of the wedjat-eye, four-fold Qmr8, creator of the mouth, who created creation, great verdant creation.” (PDMxiv 228–29.) The name Khopr-Khopri-Khopr is an invocation of the creator, which has parallels in older Egyptian texts,9 and is possibly related to facsimile no. 2, figure 3. Qmr seems to mean something like “creator, creation, mightier, or one who has power over.” Here, “it is very noteworthy that the Patriarch Abraham is called ‘the apple of the wedjat-eye.’”10 The pupil (or apple) here means not student but rather the “iris and pupil” of the eye.11 The wedjat-eye was a symbol of perfection, prosperity, preservation, wholeness, completion, health, and resurrection; in Christian times it was the word the Copts used for salvation. It occurs four times in facsimile no. 2 of the book of Abraham (twice in figure 3, and once in figures 5 and 7). 6. A sixth reference to Abraham in the papyri has the petitioner calling out, “I call upon thee, the creator of earth and bones and all flesh and every spirit and the one who stands upon the sea and shakes the heaven, who separated the light from the darkness [compare Gen. 1:4; Moses 2:4; Abr. 4:4], O great mind, lawful administrator of the universe [see explanation to facsimile no. 2, notes on figures 1, 3 and 7], eternal eye, daimon of daimons,14 god of gods, the lord of the spirits [compare Abr. 3:22–23], the fixed planet15 [compare explanation to facsimile no. 2, notes on figure 5], Jehovah [compare Abr. 1:16], hear my voice. “Thou canst not misunderstand my voice in Hebrew: [many foreign words] Blessed is my Lord, the God of Abraham. I babble in a foreign tongue.” Here the petitioner switches to speaking in Hebrew, though the text remains in Greek characters. These are some of the more than two dozen references to Abraham found in texts from Egypt. All have come forth since Joseph Smith translated the book of Abraham. Much work remains to be done before these texts and their implications are fully analyzed and understood. Though these texts tell us nothing directly about Abraham, they do tell us that there were traditions of Abraham circulating in Roman Egypt. Traditions, we must remember, often stem from older truths: “One cannot assume that earlier documents are to be preferred over later ones, or that to date a document pronounces a verdict on the age and historical value of its contents. The verdict must rest with each individual unit of tradition studied for itself.”16 Even if we had a manuscript for the book of Abraham in Egyptian, dating to Abraham’s time, the critics still would not accept the book of Abraham. Those who seek to know the truth of the book of Abraham will have to wait upon the Lord. The texts for this article come from the following sources: Karl Preisendanz, Papyri Graecae Magicae, 2 vols., Leipzig: Teubner, 1928–31, hereafter designated PGM; F. L. Griffith and Herbert Thompson, The Demotic Magical Papyrus of London and Leiden, 3 vols., London: H. Grevel, 1905, hereafter designated PDM xiv; and Janet H. Johnson, “The Demotic Magical Spells of Leiden I 384,” Oudheidkundige mededelingen uit het rijksmuseum van oudheden te Leiden 56 (1975):29–64, hereafter designated PDMxii. Translations are available in Hans Deiter Betz, ed., The Greek Magical Papyri in Translation, Chicago: University of Chicago Press, 1986. David E. Aune, “Magic in Early Christianity,” Aufsteig und Niedergang der römischen Welt (Berlin: Walter de Gruyter, 1980), II.23.2:1510–16. Some scholars advocate dropping the term “magic” in favor of “religion”; see Reinhold Merkelbach and Maria Totti, Abrasax: Ausgewählte Papyri religiösen und magischen Inhalts, vol. 17, band 1 of Papyrologica Coloniensia (Opladen West-deutscher Verlag, 1990), 1; Stephen D. Ricks, “The Magician as Outsider: The Evidence the Hebrew Bible,” in Paul V. M. Flesher, New Perspectives on Ancient Judaism, vol. 5 (Lanham, MD: University Press of America, 1990), 125–34. The restoration is the Greek word philen[or]. Neukoi can refer to the dead in general or specifically to certain dead pharaohs. See Manetho, Aegyptiaca, fragments 2.2, 7a. See Harold W. Attridge and Robert A. Oden, Jr., Philo of Byblos: The Phoenecian History, Washington, D.C.: Catholic Biblical Association of America, 1981, 40; 81 n. 49. Christine Seeber, “Maske,” Lexikon der Ägyptologie, 7 vols. (Wiesbaden: Harrassowitz, 1977–89), 3:1196–99. See J. F. Borghouts, Ancient Egyptian Magical Texts (Leiden: Brill, 1978), 1; Paul Smither, “A Rammesside Love Charm,” Journal of Egyptian Archaeology 27 (1941): 131–32. On this writing see Robert K. Ritner, “Hermes Pentamegistos,” Göttinger Miszellen 49 (1981): 73–75. See Papyrus Bremner-Rhind 28.20–21, in Raymond O. Faulkner, The Papyrus Bremner-Rhind (British Museum No. 10188), vol. 3 of Bibliotheca Aegyptiaca, Bruxelles: Fondation Égyptologique Reine Elisabeth, 1933, p. 69. Theodor Hopfner, “Der Religions-geschichtliche Gehalt des grossen demotischen Zauberpapyrus,” Archiv Orientalní 7 (1935): 118. Hildegard von Deines and Wolfhart Westendorf, Worterbuch der medizinischen Texte, 2 vols., vol. VII/2 of Grundriss der Medizin der Alten Ägypter, Berlin: Akademie, 1962, 2:1004. See Jean Yoyotte, “Contribution à l’histoire du chapitre 162 du Livre des morts,” Revue d’Égyptologie 29 (1977): 194–202. For example, compare Papyrus Leiden I 383, VI.25 with Book of the Dead 162; Leiden I 383, VI.35 with Book of the Dead 164 (the myth is detailed in the Book of the Cow); Leiden I 383, VII.30 with facsimile no. 2, figure 6, and Book of the Dead 162; see also Marie-Louise Ryhiner, “A Propos de trigrammes panthéistes,” Revue d’Égyptologie 29 (1977): 125–37. Daimon in the sense of Socrates’s daimon in Plato’s Apology 31D. This is the personal divinity who guides an individual; see also Walter Burkert, Greek Religion, tr. John Raffan, Cambridge, Mass. : Harvard University Press, 1985, pp. 179–81; James Riddell, The Apology of Plato, Oxford: Clarendon, 1867, pp. 101–9. For aion, “world,” as planet, see Irenaeus, Contra Haereses I.30; II.17.5; and A. J. Welburn, “Reconstructing the Ophite Diagram,” Novum Testamentum 23/3 (1981): 262–65; it possibly goes back to Plato, Timaeus 38B–E. John Bright, A History of Israel, 3d ed., Philadelphia: Westminster, 1981, p. 70. John Gee, a researcher for the Foundation for Ancient Research and Mormon Studies (F.A.R.M.S.) in Provo, Utah, holds a master’s degree in Near Eastern studies. He is a member of the Brigham Young University Sixty-fourth Ward, Brigham Young University Ninth Stake. The wedjat-eye appears four times in facsimile no. 2 in the Pearl of Great Price.